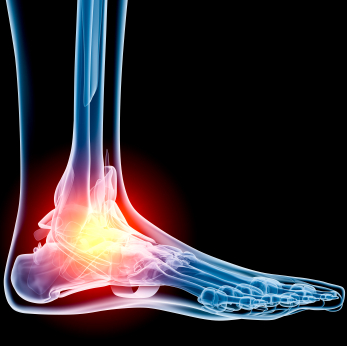 A sprained ankle it a very common injury, that involves one or more of the ankle ligaments being stretched or torn. It often happens during sports such as netball and basketball, but can also occur during normal daily activities such as stepping off a curb or walking on an uneven surface. If an ankle sprain is not rehabilitated properly it can cause ongoing pain and instability, hence it is important to see your physiotherapist for treatment and advice. It is important to start first aid treatment as quickly as possible after the injury has occurred to help limit swelling and bruising. RICER ( Rest, Ice, Compression, Elevation, Referral ) is a 5 step first aid system that can help relieve pain, limit swelling and protect the injured soft tissue, and should be started quickly after the injury. COMPRESSION – Apply gentle compression to the area by using a crepe bandage to wrap the ankle, lower leg and foot. Regularly check to ensure that it is not too tight. REFERRAL – It is important to see your physiotherapist for an accurate diagnosis, treatment and appropriate rehabilitation to prevent any ongoing complications from the ankle sprain. Physio can start as early as the day after the ankle sprain, and will aim to gradually restore full range of motion, strength, endurance and balance to the ankle, getting you back to whatever is is you like to do! Advise you on how much weight to initially put through the ankle, provide you with appropriate aids such as crutches if necessary, and most importantly advise you on when to stop using the crutches and start trying to walk normally. In many cases staying off the ankle for too long can make the recovery much slower and cause ongoing problems. Utilise techniques such as soft tissue massage, joint mobilisation, ice, heat, dry needling and taping to help reduce pain and restore appropriate movement. Implement a home exercise program which will likely include stretches, ankle and lower leg strengthening exercises, balance training, and eventually more complex sport specific training drills. Provide advice on appropriate timing for return to sport or exercise, and give you alternatives along the way to maintain fitness whilst recovering from the ankle sprain.